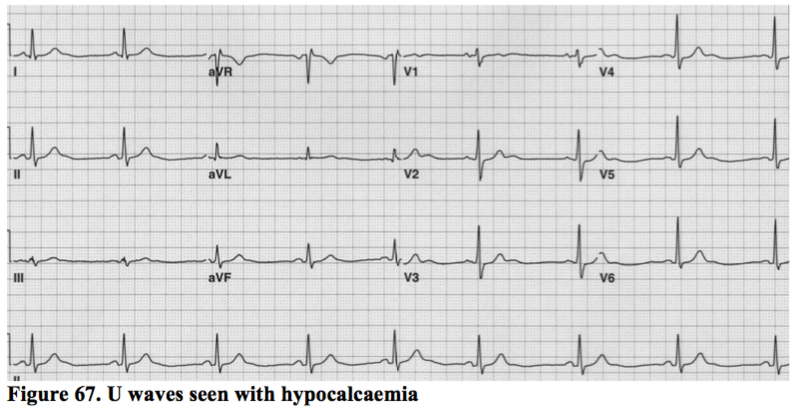 The characteristic ECG picture associated with very low levels of potassium is shown below. Initially, T wave flattening occurs, followed by the development of u waves – a structure occurring after the flattened T wave and frequently merging in with it. ST depression may occur, and the p wave may become peaked. The cause is usually one of: iatrogenic (through drugs), GI losses or renal wastage and correcting the cause with oral supplementation is usually suffice. Ventricular arrhythmia can occur, however, and mandates more aggressive therapy. Replacing potassium parenterally and rapidly is a hazardous procedure and one which should only be performed in a monitored environment. The findings can be similar to those of hypokalaemia. However, prolongation of the QTc is the classical finding. Reports exist of hypocalcaemia inducing coronary spasm and ST elevation. Hypercalcaemia also causes prolongation of the QTc with T wave abnormalities and ST depression. 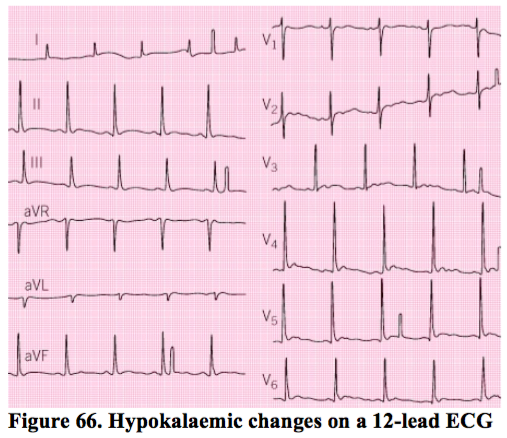 The characteristic changes on the ECG associated with hyperkalaemia are frequently related to the level of potassium in the blood. Peaked T waves, a shortened QT interval, and ST segment depression are the early signs. In more severe hyperkalaemia, broadening of the QRS can occur leading to a bundle branch block type picture. Finally, the ECG can look somewhat sinusoidal and this is a peri-arrest picture. The main causes are many, but include: renal failure, iatrogenic (drugs), rhabdomyolysis and diet. When ECG changes are present, this represents a medical emergency. 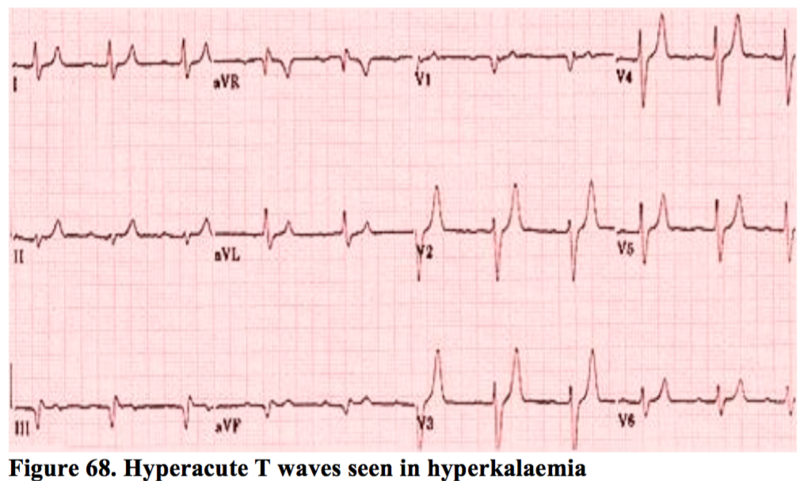 The absence of ECG changes, however, does not rule out danger in significant hyperkalaemia. The standard reverse tick appearance of ST segment may be present without toxicity but may appear more marked in toxicity. Excessive blood levels of digoxin can cause profound bradycardia (particularly in AF), or paradoxically toxicity may cause any atrial tachyarrythmia. In the example above, a lady on digoxin for AF developed renal failure and digoxin toxicity. As digoxin is principally renally excreted, it accumulated to very levels, inducing complete heart block, with a high, regular escape rhythm, marked T wave changes and AF continuing along the baseline. These changes corrected after the administration of digibind and the irregularly, irregular QRS pattern of her AF returned. Digoxin is potentiated by electrolyte disturbances, such as hypokalaemia or hypercalcaemia, and toxicity can occur as a result of an interaction with other drugs, such as erythromycin, quinidine or ibuprofen. In such scenarios digoxin can become toxic with levels only modestly above the normal range. The characteristic change associated with non-pericarditic effusions is that of generalised small complexes, as seen above. Cardiac amyloid can also produce a similar looking ECG, though axis deviation may also be present on the amyloid ECG. Global, ‘saddle-shaped’, ST elevation with PR depression represent the ECG changes associated with pericarditis. Sometimes, though, distinguishing pericarditis from acute ST elevation MI is very difficult indeed. 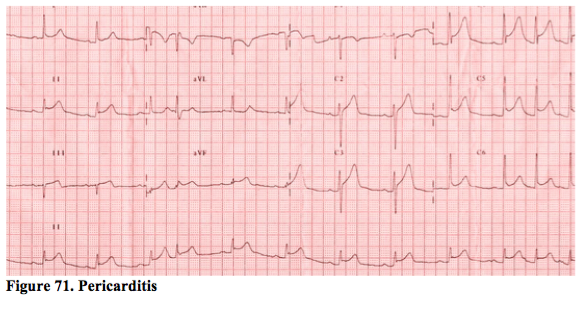 One can mimic the other, and the history is crucial before dismissing any ECG as just pericarditis. 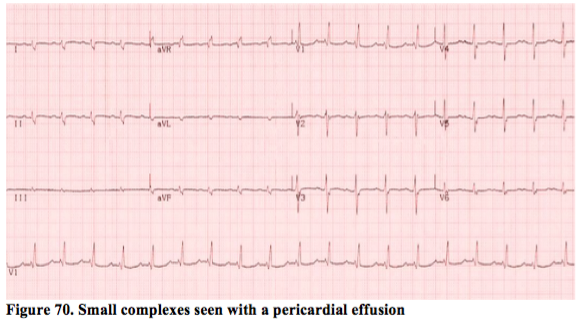 Finally, STEMI can subsequently cause pericarditis, causing one classical set of ECG changes to evolve into the other.